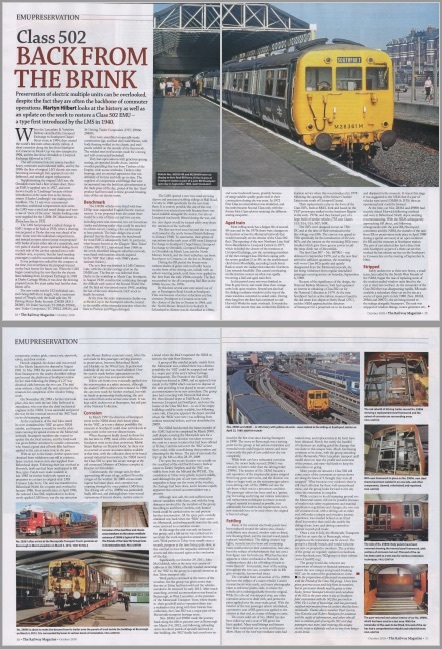 If you have picked up the October 2018 issue of The Railway Magazine, you may have spotted that our humble Class 502 is featured in a special four-page report, written by one of our members, Martyn Hilbert. A small taster of the article can be found online at www.railwaymagazine.co.uk/class-502-back-from-the-brink, but for the full story, with lots of great pictures, buy a copy of the magazine from your local friendly newsagent, or get the digital edition. As the article introduction states, preservation of electric multiple units is often overlooked. We’re glad that The Railway Magazine has redressed the balance a little.